From left: Tom Hubric, Executive Director of the Animal Rescue League, John Graydon Smith, Director & CEO of the Reading Public Museum, Lindsay Crist, Director of Community Development at the Reading Public Museum. 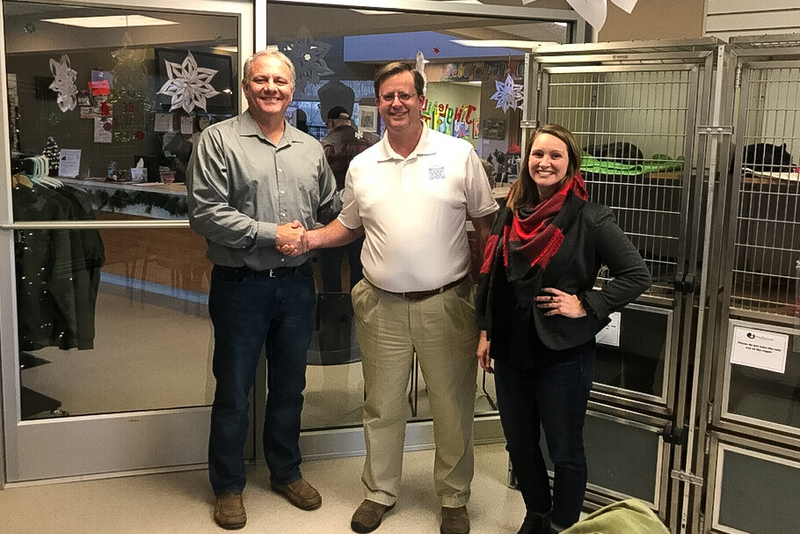 The Reading Public Museum’s Director, John Graydon Smith, and Director of Community Development, Lindsay Crist, visited the ARL of Berks County on Tuesday, December 4 to visit their newly renovated cat room. The cat room was installed with the donations received from The Museum’s Dogs & Brews event back in May 2018. In addition to The Museum’s donations, B&G Glass installed a large glass wall in the renovated space. “The addition of the glass wall separates the lobby area from the new cat room, which makes a quieter and healthier space for the animals. RPM is proud to partner with the ARL for Dogs & Brews. It’s a great way for RPM to help on projects at the ARL and we hope to be able to do so for many years to come,” explained Lindsay Crist, Director of Community Development at The Museum. Dogs & Brews is held every year over Memorial Day Weekend at The Museum and a portion of the proceeds is donated back to the Animal Rescue League of Berks County. The annual event will take place on May 26, 2019.